One of my favorite things to do when visiting a country is to check out its local car museums. It’s a good indication of what types of cars are appreciated there, how the local car industry has influenced life around it and how the local culture has influenced the cars as well. Unlike in Italy, where a lot of the museums are located in more or less the same area, the Japanese museums are much more spread out. One in Japan that’s always eluded me was the Nissan Zama Heritage Collection—until recently, at least. The Honda Collection Hall is at Motegi, about two hours north of Tokyo, while the the Toyota Automobile Museum is in Nagoya, a two-hour bullet train ride south of the capital. There are a couple other museums and collections spread throughout the country too. But until very recently, maybe four or five years ago, Nissan’s collection was inaccessible to the public. It was a case of knowing the right people to get an invitation inside. But now, a limited number of people are allowed in to the collection each day. It’s become a place where enthusiasts can visit and see the history of one of Japan’s biggest and well-known automakers. You just have to apply online and then entry is free. Now, the reservation process is all in Japanese and the guided tour is also Japanese, so it’ll help to bring someone to translate for you. The staff at the Heritage Collection stress this isn’t a museum but more a storage garage. Since opening its doors to the public, the Heritage Collection has had over 15,000 visitors through its doors. The cars inside are a mixture of cars owned by Nissan and ones donated by private individuals and members of the Nissan Owner’s Club. There were about over 300 cars there, ranging from the very first Datsun 12 Phaeton to Le Mans racers, Super GT legends, and pretty much every iteration of the GT-R ever. Seventy percent of cars are kept in drivable condition. A lot of the cars get brought out to events or displayed various showrooms and museums. There are two tours every day: one in the morning and one in the afternoon. The tour is split into three sections, starting with an introduction video to the history of Nissan. Amazingly, the video was in English with Japanese subtitles. Part two is a guided tour around the cars with the guide explaining the significance of some of the items in the collection. Finally, there’s a 45 minute free time to walk around the collection yourself to take photos and videos. As soon as the doors opened, my jaw dropped. If the NISMO Festival at Fuji Speedway is like watching Gran Turismo racing in real life, then the Heritage Collection is like stepping into the ultimate Gran Turismo Nissan showroom, as if all the cars in those games were gathered in one place in real life. And I do mean all of them. From Pennzoil to Calsonic, they’re all here. Luckily for me I was able to skip the guided tour bit and just went straight to free time. The staff were extremely friendly and taking the whole garage was breathtaking. It wasn’t the fact that I’m the biggest Nissan fanboy in the world and seeing a 1935 Datsun 12 Phaeton or an original Infiniti Q45 makes me salivate, but it was more the impact of seeing all these cars in their well-kept condition lined up perfectly in chronological order. It’s a massive facility, the Heritage Collection is located in a small corner of what remains of Nissan’s Zama Operations facility. According to the staff there, during Carlos Ghosn’s shakeup up of Nissan in the early aughts, he sold off some of the land here. What remains of the original Zama factory is now used for Nissan’s development of EV tech. Originally built in the 1960s, this was the factory where cars that liberated the people were built such as the Sunny, Cherry, and Datsun trucks. Unsurprisingly, there’s a fair few of these cars on display at the collection today. It was also a good reminder of some of the more interesting cars from Nissan’s past that have been forgotten today, such as the Pulsar GTi-R, a homologation special hot hatch with 227 horsepower and AWD. The appropriately named “Hypermini” was Nissan’s first foray at an EV. With a range of only 71 miles, it wasn’t going to change the world anytime soon, but laid the foundations for what would become the Leaf. Nissan only made around 300 of these. Then there’s the Bluebird SSS, fro a time when Nissan used to make exciting small sedans. While I was admiring some of the racing cars, particularly the only road-legal GT-R LM, one of the caretakers took me aside. He asked me to follow him to the start of the collection. It turned out he saw me admiring the R33 LM and wanted to give me a one-on-one tour of the history of the Skyline. Since this year marks the 50th anniversary of the GT-R name, it would’ve been simply rude to decline. It all started with the Prince Skyline. When Nissan acquired Japanese luxury automaker Prince, it wanted to compete in motorsports with the Skyline, which originally had a four-cylinder engine. Nissan decided to put the six-cylinder engine from the larger Gloria into the Prince Skyline. The original Skyline was referred to as the “short-nose” due to it only having a four-cylinder; to accommodate the Gloria’s six-cylinder engine the bonnet had to be stretched. This was the first time the Skyline GT badge was put on the side of a Nissan car. Learning from their motorsports competition of the Prince Skyline, the Nissan Skyline GT-R was born in 1969. The first-generation Skyline GT-R took Japan’s small, light, and race-bred sedans and coupes to a new level. It kickstarted a long line of performance monsters. The second-generation ‘Kenmeri’ Skyline was an evolution of the Hakosuka, but much much rarer. Fewer than 200 of these were made though no one knows the exact number. My guide’s guess is around 197. After a near 20-year hiatus, the Skyline GT-R was brought back in 1989 with the R32 Skyline. Proving to be a success in motorsports, it evolved into the R33. This generation coincided with the 40th Anniversary of the Skyline and brought back the four-door GT-R as well as the one-off LM. Made to allow Nissan to participate in the GT1 race series at Le Mans, the single road car was built and registered in the UK. Finally, the R34 was the end of the line for the Skyline GT-R. This is a car that needs no introduction. Today, the GT-R is known without the Skyline moniker, and it’s been on the market a while but is still at the top of its game. We ended the short private tour in front of the Prince R380, behind it a modern R35 Super GT racer. 40 years separate these two cars but that’s where it all began for the GT-R. My guide summarized it well by saying Prince is basically the predecessor of NISMO. 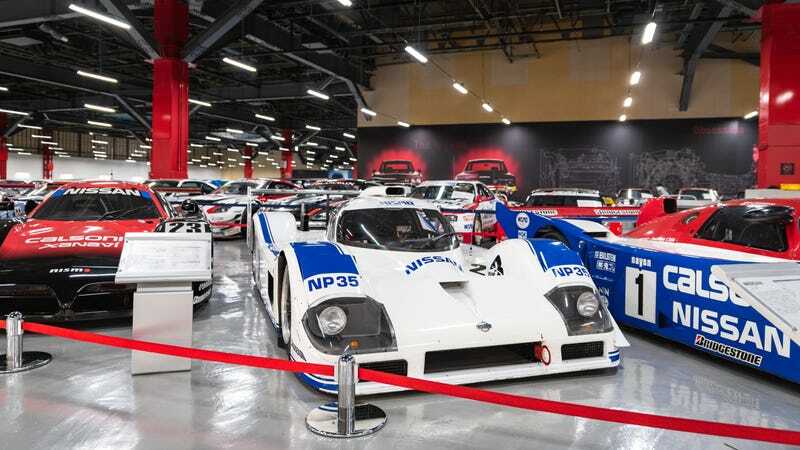 While Nissan adamantly calls this a storage facility, the Heritage Collection was without a doubt the best museum-but-not-a-museum I’ve been to. From the condition of the cars inside to the facility itself, the sheer size and cleanliness of it was phenomenal. Even if you’re not a massive Nissan fan, just to see all the history under one roof is a special thing to see. Not to mention the incredibly friendly staff and coming out at the end having learnt a little bit more about the company that gave us the GT-R.
Here’s a little bonus for you. On Sept. 23, for a special GT-R themed meet at the Daikanyama T-Site, the Nissan Heritage Collection brought out the one-off 1973 Skyline 2000GT-R show car displayed at the 1972 Tokyo Motor Show and R33 GT-R LM to complement the Japan debut of the ItalDesign GT-R50. It fit in well with the old hits.